An eggdrop-like soup with spinach and noodles. Low calorie and low fat, freezes well. Now you can have a warm, fudgy brownie ready in minutes! This single-serving mug brownie will cure your sweet tooth with minimal calories. No need to make a whole pan when you really just want one serving! 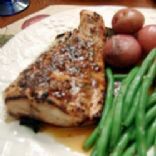 These pork chops are super easy to make. Try serving them with acorn squash and a spinach salad with chopped apple slices! This is so simple and you don't need to stand over it while it cooks. Everyone in the house loves it, except the 3yr old lol. The rest of my children actually beg me to make it! This tasty, savory bread is a wonderful way to use fresh rosemary, either from your garden or from a market. This chicken has a creamy coconut milk taste with a little kick! 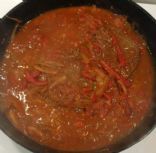 This recipe was adapted by my husband. It's got everything that you need to eat after a good morning run. We use soy milk for this recipe. Regular milk can easily be substituted. These cute chick cake pops are packed with vanilla frosting and fresh strawberries! This is a chocolate pudding recipe that I modified for my lactose intolerant husband. It uses Unsweetened Original Almond Breeze, but I think that unsweetened soy milk would work too. Adapted from a recipe seen on 101 Cookbooks, this is a spectacular, powerful boost to your morning whether you serve it warm or chill it down for a midday "pudding". Any berries can be used, I prefer strawberries or blueberries, or a mix! Dairy Free, Flavorful Corn Muffins. They are a nice sweet and tart indulgence at under 60 calories. Great for breakfast or as a snack. This uses less egg whites than most. Less than 100 calories per serving! Vanilla cupcakes lighten up just in time for spring. Fondant makes these cupcakes look impressive in mere minutes! This is a flavorful and filling light meal.